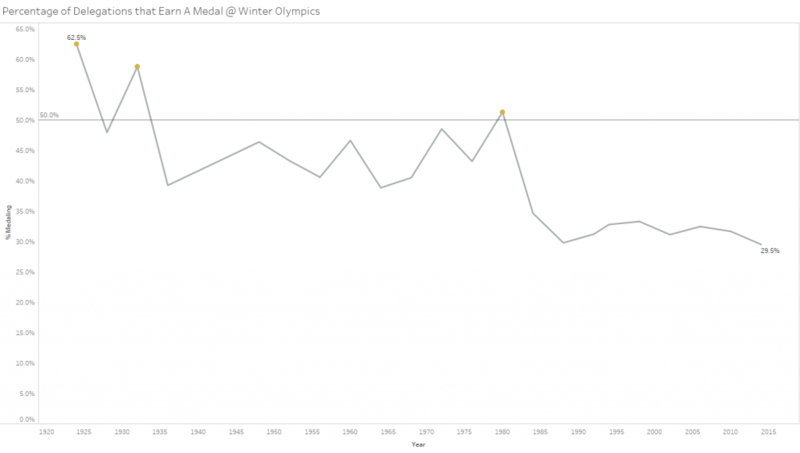 At the time of writing the 2018 Winter Olympic Games are in full force, so it seems only natural that the #MakeoverMonday topic for Week 7 of this year is record level results of Winter Games medal wins. 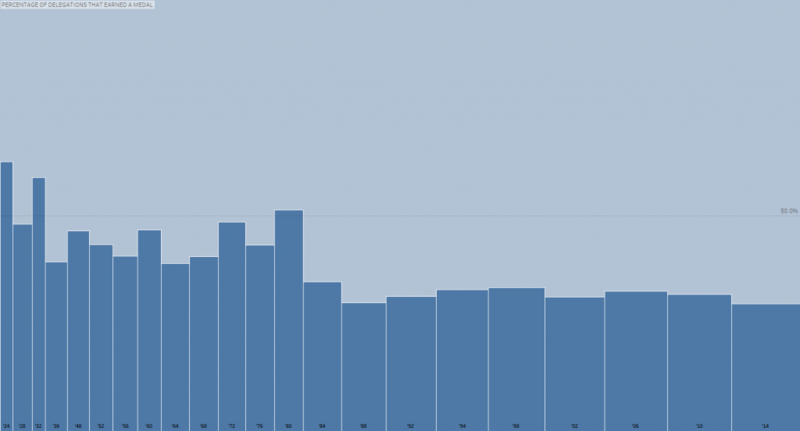 I always find with this level of data there are so many interesting things that can be done that it gets really hard to focus. The trouble is that all of the rows are interesting, so as a creator I’m immediately drawn to organizing “all the data” and want put to it ALL on display. And that’s where the first 20 minutes of my development were headed. 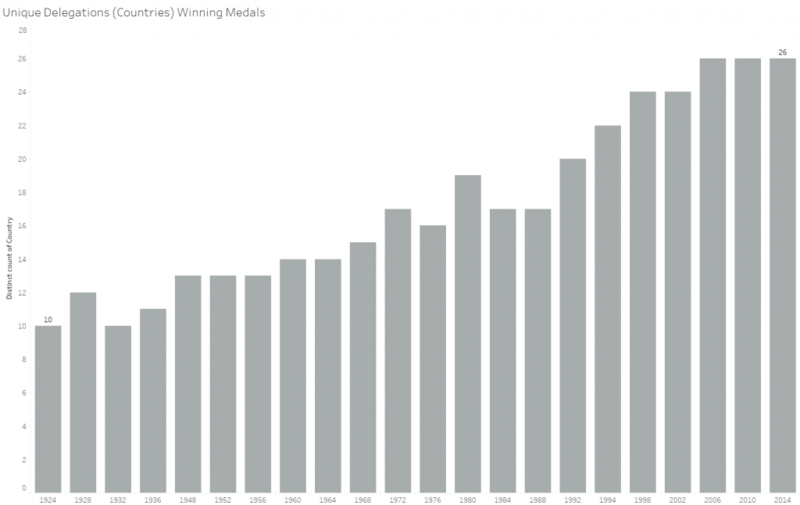 I’d started with a concept of showing all the medals and more specifically showing the addition of new sports over time. As I was building, the result was quite clearly going to be a giant poster form viz. Not what I was going for. I spent some time stuck on this – thinking through how I could segment by different sports and to extract out some of the noise of the different years and come up with a slope chart. Ultimately I found myself disappointed with all of these pursuits – so my thoughts shifted. Which as you look through it is REALLY interesting. 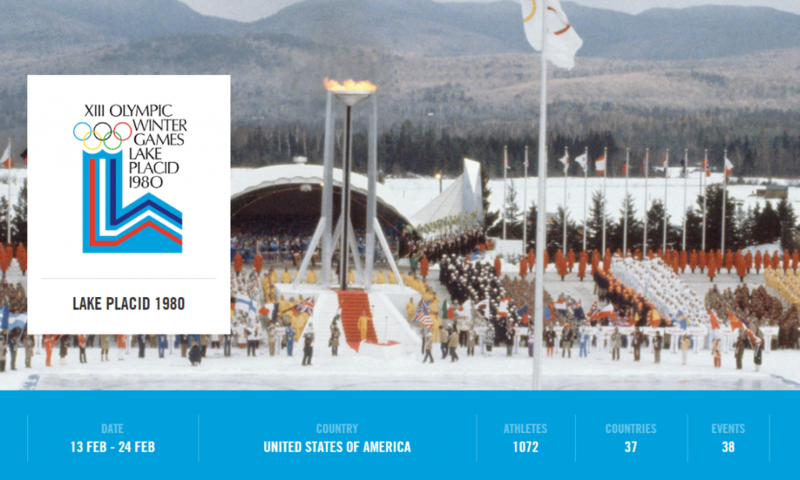 I had just watched the Opening Ceremonies and knew there were 91 delegations (countries) represented in 2018. To know that in 2014 the number was probably similar, yet only 26 reached a podium seemed to be a sticking point in my mind. Using the ribbon of information at the bottom I went about collecting and enriching the data set. 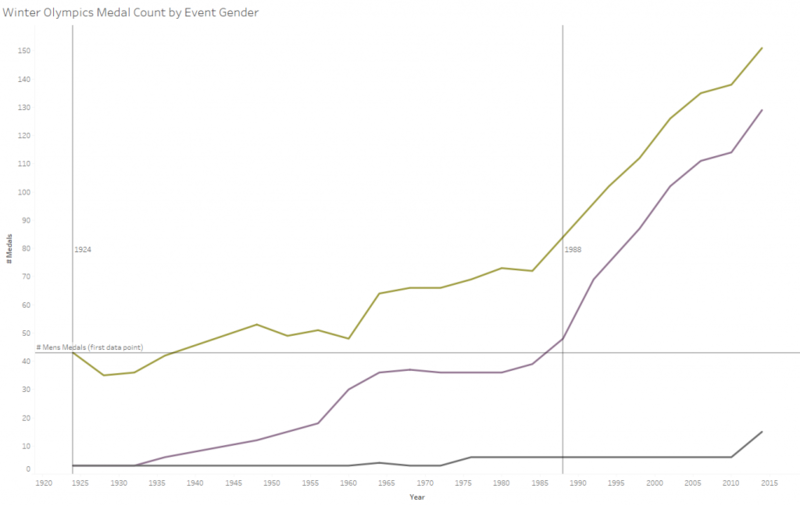 Because what was missing from our original #MakeoverMonday data was the NULLs. What are you looking at? 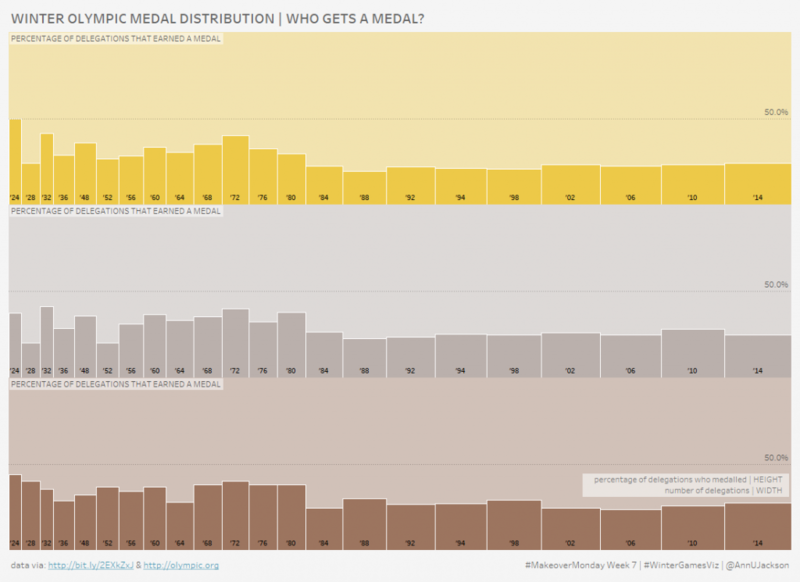 Medals are clearly parsed out into Gold, Silver, and Bronze. 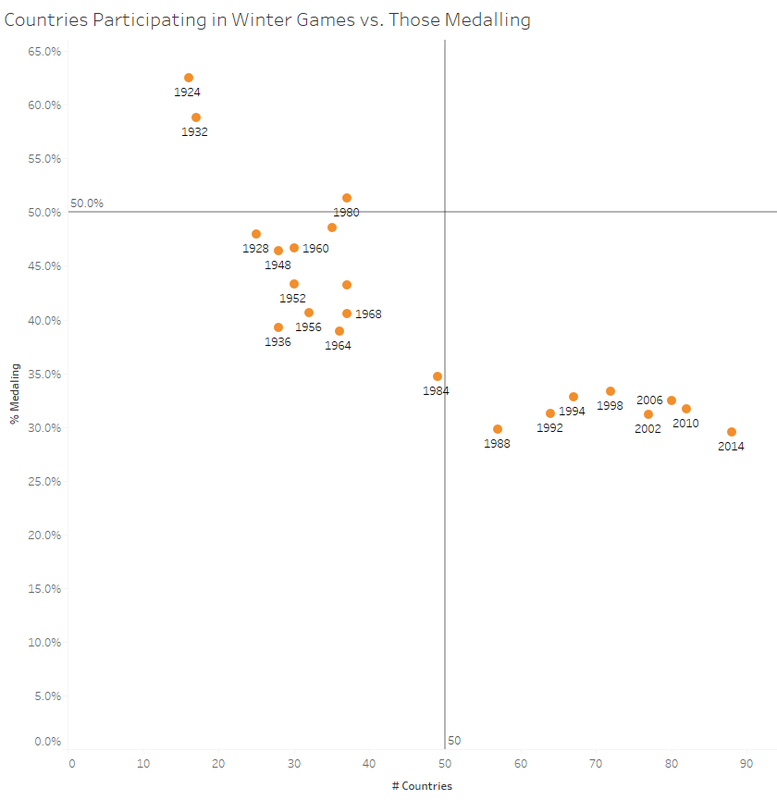 Each bar represents a Winter Games. The width of the bar is the # of countries/delegations, the height of the bar is the % of countries who medalled in that respective color. I concede in this that eliminating the dimensionality of medals may have made for a more consolidated view, but I selfishly wanted to use the different colors. I’m quite pleased with this one. Maybe because I am the designer, but I was delighted with the final representation both from a visual perspective and an analytical presentation perspective. There is a certain amount of salience in having both the bars gets larger over time (and repeating that 3 times) and the colors of the medals being represented within a single worksheet.